I read Robinson's Housekeeping last year (or maybe the year before?) and I have to say I really hated it for coming across as one of the most pointless stories ever to use up good ink! I didn't get it then and I don't get it now. So when my mom gave me Gilead to read for my birthday (last year) I can't say I was all that hyped up to read it. However, since my mom gave it to me, I determined that I would read it. Thankfully, Robinson improved during her twenty-some odd year writing hiatus. I'm personally glad she took a break. Whether or not the time made her a better writer is, I suppose, anyone's guess. Certainly I'm not an elite critic, nor do I have the skills to properly review one work in comparison to any other. I can merely tell you that some books I like and some books I don't like. Gilead I liked. Gilead is a narrative of the seventy-seven year old Rev. John Ames who is recounting his life story on paper for his six year old son's future benefit. He starts out wanting to tell him the story of his ancestors and ends up reflecting on some of life's hardest blows so that his son will know he thought and reacted towards various people and circumstances. Ames comes across (to me) as a deeply introspective Father Tim (Mitford). You just like him for everything that he is and are willing to support anything that he chooses to do. I thought Robinson showed great skill in relating her view of human nature when describing her character's attitudes and behaviors. A lot of it had a ring of C.S. Lewis to it. She could use a description to paint a whole person which is an admirable trait and it makes it incredibly easy to enjoy the story. All the same, this was thoroughly enjoying and thought-provoking in many ways. It was a wonderful and delightful read and I must thank my mother for it! I can't think of many instances where I can so thoroughly enjoy one work of a particular author and hate another from the same person. However, this seems to be my fate with Robinson. It's curious but....something I must live with! One of my absolute favorites. I rated it 5/5. Yeah, I'm glad you liked it! I had never read the author before, but heard about this book while at a seminar for Christian teachers a year or two ago. A thought provoking little read. It ALMOST convinced me to keep a journal. I've heard similar thoughts about her two books. I haven't read it yet, but would like to sometime. I have read several favorable reviews on this book. I may have to give it a try. Thanks for your review. I followed your link from Semicolon. I've read both, and prefer Gilead. There are more layers to it, and I think the religion and theology in it make it a more profound work. Robinson is not an easy read, though, and I think Housekeeping was so tragic, and so slow in pace, that it's a hard book to like, though I did appreciate the skill of the writing. 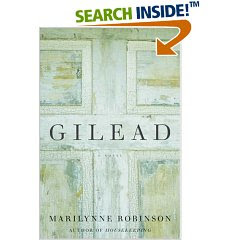 I read Gilead first and liked it so much that I thought I would really enjoy Housekeeping. However, I only made it through about 3 chapters of the latter. It's a lovely book. I recently read it myself. Housekeeping is very different proposition... however, it's often regarded as a masterpiece in its own right. I'm actually midway through reading it, and I agree it's heavy going. But some of the description, some of the poetic language, is really quite memorable, and foreshadows the precision and beauty of the writing in Gilead.